Four Adolfson & Peterson Construction (AP) projects were given the ENR Mountain States Best Project Awards this week. Hundreds of industry personnel gathered for the formal award acceptance and breakfast in Denver to honor the region’s top construction projects completed last year. United Property’s Inova Office Building 1 project won first place in the Office/Retail/Mixed-use category. 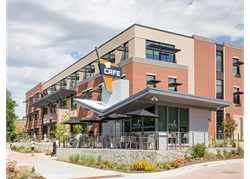 This project consisted of a 220,000-sf, Class A Suburban office building on a 58-acre campus that included mixed-use office, industrial, hotel and residential facilities. To ensure a cost-effective and fast-track schedule, the AP team used a 5-story (4+1) concrete tilt-up for the exterior walls, the tallest tilt-up in the Denver area. The City of Fort Collins Block 32 Utilities Admin Building won first place in the Green Project category. This new 3-story, 37,500-sf municipal office building incorporates sustainable features, such as photovoltaic panels, an insulated enclosure and windows, the state’s first perennial outdoor living wall and a rain garden. The project achieved LEED v4 Platinum certification by the U.S. Green Building Council. In the Culture/Workshop category, AP’s Silverthorne Performing Arts Center project received a Merit Award. The 17,000-sf building consists of a large 130-seat black box theater, a smaller intimate black box theater, administrative offices and conference rooms, rehearsal and educational spaces, a reception lobby with a bar, and an outdoor performance area. With high-end finishes and the capability to hang art on the side of the building this will be a main attraction for the Town of Silverthorne. The Front Range Community Campus Renovations project won a Merit Award. This 35,000-sf renovation of occupied facilities had a goal of unifying all student services into a centralized location. In addition to renovating other interior spaces to accommodate classrooms, offices and a performance/lecture hall, the scope of work included mechanical and structural upgrades and improvements to the building envelope. Adolfson & Peterson Construction is a U.S.-based, privately held firm that is consistently ranked among the top 50 construction managers and general contractors in the nation. Founded in 1946, the company has built longstanding commitments to the regions in which it operates and is known nationally for its innovative and collaborative approaches within the building industry. Adolfson & Peterson Construction serves the education, multifamily, healthcare, commercial, municipal and senior living market segments from its offices in Dallas, Denver, Minneapolis and Phoenix. For more information, visit http://www.a-p.com and follow us on Facebook, LinkedIn and Twitter.